Note: Nest Bedding is a mattress company that primarily sells its beds online, though it does have a handful of showrooms. Here we review the Love & Sleep bed from the company, their entry level all-foam bed. We have also published a review of the Alexander Signature memory foam mattress, a review of the Alexander Hybrid mattress (made of foam over pocketed coils), and a review of the Nest Latex Hybrid, a latex-over-pocketed-coil mattress. If you’d prefer to watch rather than read, check out our full Nest Love & Sleep mattress video review above. GoodBed's Take – Who is the Best Match for a Nest Love & Sleep Mattress? Nest Bedding describes its Love & Sleep mattress as an 11” mattress, although we found that it measured closer to 10”. This is an all-foam mattress. The top layer is a 3” piece of the company’s Energex foam. Nest claims that this foam has the pressure-relieving properties of memory foam (we found it to be more comparable to latex than memory foam). The next layer is a 1” piece of convoluted (egg crate) polyurethane foam in a 1.8 lb. density, with a 6” support layer of standard 1.8-lb polyurethane foam. The mattress is wrapped in a non-removable knit cover that has about ½” of thickness to it. Nest says the cover contains some phase-change material, meaning it is supposed to feel cool to the touch. In our evaluations, we found the Love & Sleep mattress to have a Medium Soft softness level (it also comes in a Firm version) with very good support and spinal alignment for back sleepers and side sleepers in particular. Compare the two softness levels on the Love & Sleep website. Motion isolation was excellent in our standard tests, with both a 16-lb. bowling ball as well as our 200-lb. tester. Part of that owes to this bed’s quick-responding top layer of foam, with almost none of that slow-responding/melting feeling you would get with a memory foam bed. That makes the Love & Sleep bed a good choice for those who are concerned about feeling a partner’s movements on the other side of the bed. Perhaps the most notable characteristic of the Love & Sleep bed is its price: $599 for a queen size foam mattress. That’s substantially lower than most online-only mattresses, and it compares well to budget mattresses you might find in a discount furniture store or Ikea. Even so, this is a no-frills mattress without any particular innovation, and the mattress is covered with a basic knit wrapper, not the plush and cushioned pillowy covers we’ve been seeing on competing, though higher priced mattresses. The bed’s name, Love & Sleep, is a nod to the company’s claims that this bed has some bounce to it, which some prefer for late-night activities with a partner. We did not find this mattress to be bouncy at all, however. If you are a back or side sleeper, we do think the Love & Sleep is worth consideration. Among our concerns: We did not feel this mattress was appropriate for those who sleep primarily on their stomachs. As with some other all-foam mattresses, in our tests it proved too soft for sleeping in this position, as hips sink too far into the mattress, creating arch in the back instead of a healthy neutral spinal position. This can lead to back pain. If you like to sit on the edge of the bed, or tend to lie right on the edge, edge support with the Love & Sleep mattress is poor; our tester felt himself sliding off the bed while laying right on the edge, actually being pulled to the floor. If you have kids or pets that tend to force you to the very edge of the mattress, some other models may work out better for you than the Love & Sleep mattress from Nest Bedding. We also had concerns about this mattress feeling hot for people susceptible to this. Although the cover includes some phase-change material, we did not find that it felt cooler to the touch than any other mattress cover. And while the mattress does include some convoluted foam for better air flow, that layer of foam is just an inch, and it’s three inches into the middle of mattress. Lastly, the Love & Sleep mattress is more cushioned that most, so you sink more deeply into the mattress, meaning less of your body is exposed to air. For those that don’t have historical problems sleeping hot, we believe you’ll be fine on this mattress, but if you know you are prone to this, there are better choices. Note that the Love & Sleep mattress does not come with a box spring (nor does it need one). You can place the Love & Sleep bed atop the support of your choice, including a separately purchased box support, a bed frame, platform bed, or adjustable bed frame. You can also choose a Nest Bedding foundation, but it's not required. Free shipping is included, but delivery and setup in your bedroom costs extra. Overall, we felt the Love & Sleep mattress would be a good choice for those who sleep primarily on their backs and sides, who prefer a softer, more cushioned mattress. The Love & Sleep mattress is made of three foam layers stacked and glued together. The top Energex foam layer is the company’s proprietary foam. Nest claims that this foam has pressure-relieving properties of memory foam, but we found it to behave more like a synthetic latex than memory foam (read more on the Energex foam). The middle transition layer is a 1” convoluted (egg crate) foam, with a 6” standard polyurethane foam as the support layer. The three layers of the Love & Sleep mattress are wrapped in a very sturdy feeling knit cover. The cover is stretchy and has some thickness but falls short of the claimed 1” of loft advertised on the website. The cover contains some phase-change material, meaning it is supposed to feel cool to the touch. We classify the Love & Sleep mattress as a Medium Soft in terms of softness overall. If you like that feeling of sinking into your mattress, we think you will like the Love & Sleep mattress. Note that we tested the Medium version of this bed; it’s also available in a Firm version. This refers to how deeply you sink into the mattress or feel cradled or hugged, versus a feeling of floating on top of the bed. We found the Love & Sleep again to be on the deeper side when it comes to cushioning. The Love & Sleep mattress doesn’t include any memory foam, so it doesn’t have much of that slow, melting-into-the-bed feeling you typically get with a memory foam, but there is a little. This also translates to bounce, which we test in two ways. When we dropped our 16-lb. bowling ball in the mattress, it bounced a couple of times, and when our tester dropped his weight onto the bed, he did not bounce at all. This mattress has practically no bounce at all, which comes into play when we discuss motion isolation further below. What’s interesting is that the company claims this mattress is as bouncy as an innerspring mattress, and in our tests, we just didn’t find that to be true. In our evaluations, the Love & Sleep mattresses afforded very good support for back and side sleepers, and would be suitable for a broad range and sizes of people who tend to sleep primarily in those positons. We did not, however, feel that the Love & Sleep mattress would be a good choice for those who sleep on their stomachs. Because this is quite a soft mattress with significant cushioning, our tester found his hips and midsection sinking too deeply into the mattress, introducing over-arching in the back. While our tester was on his back, he noted that his hips sank just deeply enough to create a good spinal position. He felt his midsection sinking in a bit more than with other mattresses, but this wasn’t problematic. We feel that sleepers of a wide weight range, especially those who prefer a softer mattress, would have a similar experience in this position on the Love & Sleep. Side sleeping was excellent for our testing, and the Love & Sleep really excels here. Our 200-lb. tester’s shoulders and hips were able to sink into the mattress while the mattress continued to support his waist and midsection. We noted that the overall feel was similar to latex in this position. We might have some concerns about those who are much heavier than our tester, in which case we might suggest going with the Firm version of this mattress. Achieving good spinal alignment for stomach sleepers can often be trickier as the hips can tend to sink down too far with some mattresses, and this was the case in our testing with the Love & Sleep mattress. Our tester’s hips and midsection sunk down deeply creating a less than ideal spinal alignment, which over time could lead to back pain. If you sleep primarily on your stomach, other choices would be better in our view. Overall, we found the pressure relief offered by the Love & Sleep mattress to be very good. While the company claims its Energex foam has the pressure relief properties of memory foam, we found it not quite equal. Still, pressure relief was good, aided by the deeper than average cushioning of this mattress. 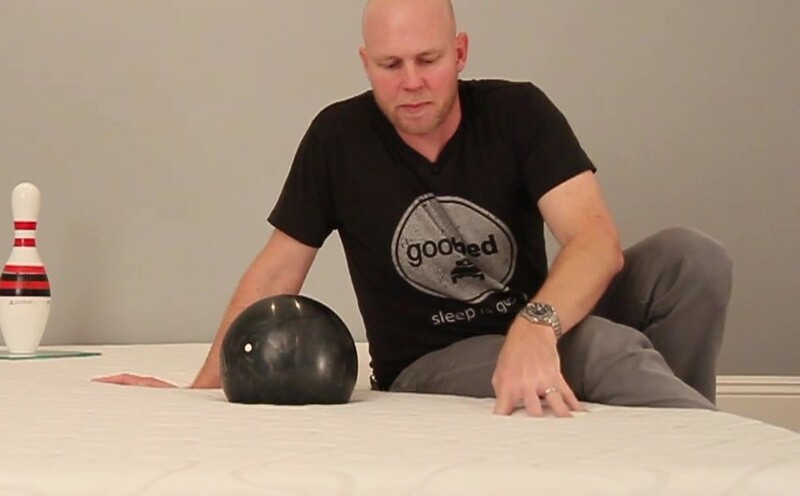 With a bowling pin standing upright on the Love & Sleep bed, we tested motion isolation by dropping a 16-lb. bowling ball on it, as well as the whole weight of our 200-lb. tester. In both tests, the pin barely moved at all. For that reason, we felt that the Love & Sleep bed would be an excellent choice for couples who don’t want to feel their partner getting in and out of bed. For those who don’t have a historical issue of feeling hot in bed, we do not think the Love & Sleep mattress will feel overly warm. However, this is an all-foam mattress with deeper than average cushioning, meaning less of your body is exposed to air. And while a thin layer of egg crate foam is included, it’s three inches down into the mattress, so we’re not sure it’s providing much benefit. If overheating in bed is an issue for you, and you’ve experienced it with other mattresses, other models have features that are specifically intended to address this. Foam mattresses aren’t typically very supportive along the very edge of the mattress—important if you like to sit on the edge of the bed, or if you tend to sleep along the edge. And that’s the case with the Love & Sleep. When sitting on the side, our tester sank through virtually the whole mattress. When laying on the very edge of the mattress, our tester felt his body starting to lean and slip off the edge pretty much right away, and the whole side of the mattress started to melt away under his weight. If you spend a lot of your sleep time right on the edge of the bed, we feel other mattresses will be a better fit. If you tend to move and change positions a lot over the course of a night, ease of repositioning will be a priority for you. Our tester did experience any big problems, though this mattress does have deeper cushioning which could make changing positions a bit more a challenge for those with a known issue. Overall, we don’t expect most people will have big problems here. While we did not test the Love & Sleep mattress on an adjustable base, Nest says that an appropriate frame will not harm the mattress. The Love & Sleep mattress is an 11-inch mattress (we measured closer to 10”) made of three layers of foam, wrapped in a soft and stretchy cover. The top layer of foam is the company’s proprietary Energex foam, which we found has some properties of synthetic latex. 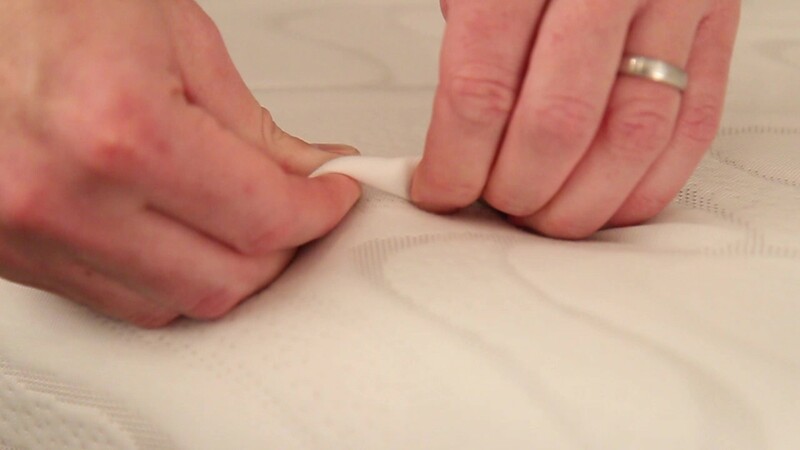 When it comes to estimating the comfort lifespan of a mattress, we tend to use foam density as our best, albeit imperfect, predictor of how long a foam will retain its shape and resiliency. The top Energex layer is a 2.8 lb. density, and that’s definitely on the low side of what we like to see for a mattress’s comfort layer. But the price is also lower. The lower layer of foam is a standard 1.8-lb. density polyurethane foam. Given the foam quality, we would expect an average lifetime out of the Love & Sleep bed, and the company does include a lifetime guarantee against sagging (as long as the depression is greater than an inch). As Nest Bedding’s entry level product, we do think the Love & Sleep mattress represents a good value, especially compared to what you might find in a discount furniture store, or Ikea. We do think the mattress is well made, and found it to be an especially good choice for back and side sleepers who prefer a mattress with deeper cushioning. 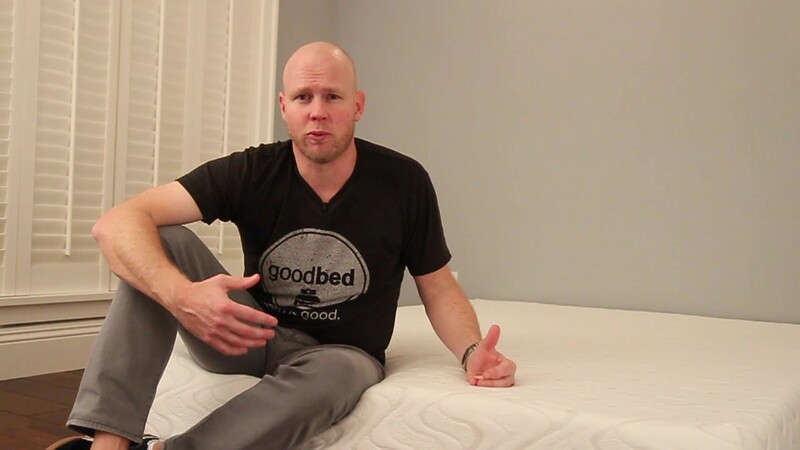 From a performance standpoint, we’ve reviewed other beds that in our view were better for stomach sleepers, had more plush covers, better edge support, etc. And some of those mattresses cost just a couple of hundred dollars more than the Love & Sleep yet offer measurably better features. Even so, for a wide range of people, the Love & Sleep is a low-hassle, basic mattress that comes with a top-notch 100-night trial period and solid lifetime warranty. Nest offers buyers a 100-day trial period, and urges buyers to give the mattress at least 30 days before initiating a return. Upon proof of donation to charity, the company will refund your money. It’s up to you to find a charity that will accept the mattress. See: Nest Bedding returns policy. This Nest Bedding warranty extends to the original owner for as long as they own the mattress and assumes it has been placed upon an appropriate foundation. Summary: Is the Love & Sleep Mattress Right for You? The Love & Sleep is a basic but solid foam mattress that will be suitable for a wide range of people, in our view. Here’s who we think the mattress is best for, based on our tests. Is the Love & Sleep bed right for you? Take our Mattress Match Quiz to find mattresses that fit your needs, based on your preferences and price range. Looking for more on the Love & Sleep mattress? Visit NestBedding.com. Touted for side sleepers, how does the Nolah perform in our tests?